Although Krishna is invisible to us in our present state, we can perceive His presence through His energies, which are everywhere. Although innumerable, His energies fall into three primary categories. Krishna’s internal energy expands as the spiritual world in all its variety, including His ever-liberated associates there. The internal energy is eternal and full of knowledge and happiness. Presently beyond our perception, the spiritual world makes up most of reality. Krishna’s external energy consists of all that is matter: the material world, the laws of material nature, material bodies, and so on. The external energy is temporary and full of ignorance and suffering. It is inert by nature and must be moved by spirit. The material world is a tiny fraction of God's creation. 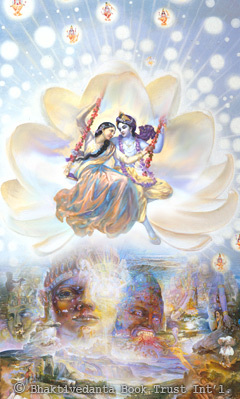 We finite spirit souls are expansions of Krishna’s marginal energy. We can choose to live in the spiritual world or the material world. Or, to put it another way, we can be deluded by matter or illuminated by spirit. Both the external energy (matter) and the marginal energy (we souls) can become fully spiritualized by contact with the internal energy through acts of devotion to Krishna (Bhakti yoga).